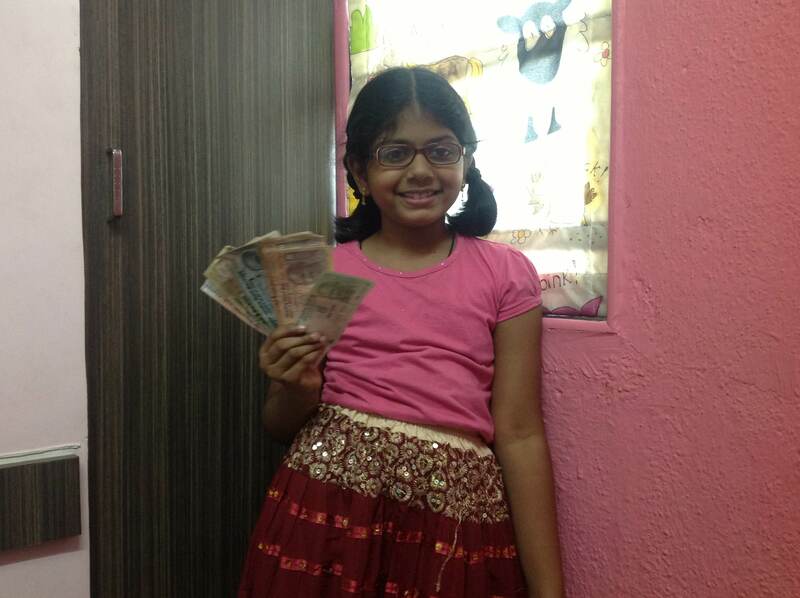 Have you heard a 9 year old say “I wasted Rs 1,000 on buying a necklace and on eating out” The moment I heard it from my neighborhood friend, Srilekha Arun’s daughter, Pranati, I knew I had found the first money savvy kid for my blog. Given her age, Pranati, could have spent the money on a doll set. She could have dragged her mom to a mall to buy new dresses for birthday parties or she could have treated her friends at a pizza or a burger joint. Instead, she chose to put the money back to work, in her piggy bank. This was the money she earned by hosting a game show with the help of her mom and dad, not to forget her naughty little brother, Pradyut. A game show managed by kids!! Aren’t kids meant to have fun? Surely all this money saving morality can come up when they’re older! Besides, how will we ever get them to stand at a stall? Well, it all began out of boredom. Every winter our building hosts an annual fun fair. Kids across age groups usually dance to popular bollywood numbers, families come together, eat together and a play a “housie”, “bingo” or some such draw based game. Last year, Srilekha decided to do something different. She thought of buying a stall and hosting a game show. She engaged her daughter in each and every aspect of it. The deposit money of Rs 500, for putting up a stall and overhead costs of Rs 300 for buying prizes and putting banners for game show came from Pranati’s piggy bank. The young girl helped her mom decide the three games, she painted the banners to attract her friends and their parents to her stall. She stood at the stall for two hours as people came and enjoyed the games. She got the fruit of her labour, Rs 2800 cash earned by charging Rs 10 for each of the three games. That fun fair, changed Pranati’s approach towards money. You can see that in her attitude when you ask her what she did with her prize money. She says she “wasted” instead of “spending” Rs 1,000 of the total amount. She recounts her experience of being a game show host. While the young girl surely has an idea about earning, job and income, Srilekha says that the whole process of hosting the show, attracting people, managing it has taught many more long lasting lessons to her daughter. Here are the four lessons in mother’s words. We decided to keep Rs 10 each for three games and if anyone wanted to play all the three games, we offered it at Rs 25, a discount of Rs 5. Pranati understood that people had to be encouraged to play three games and that’s how we could earn more. Some of our neighbors came with Rs 50, Rs 100 notes. 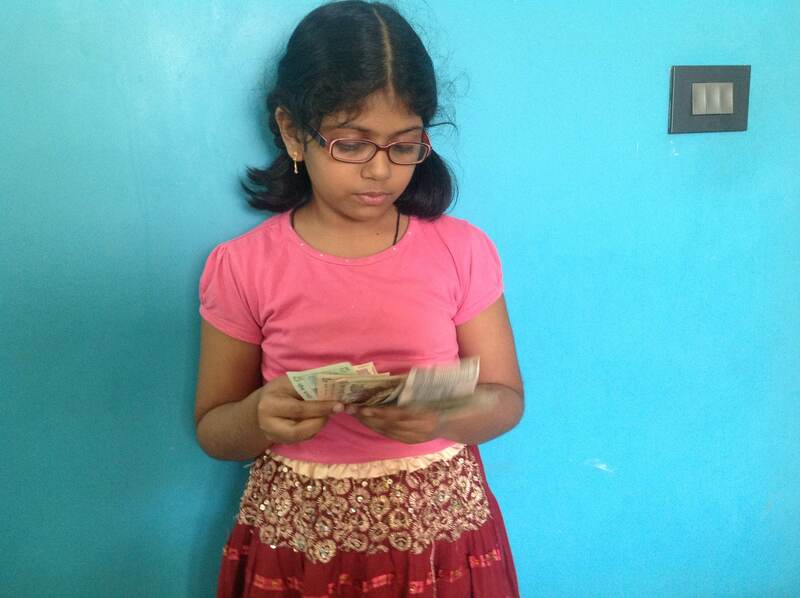 While handing over the balance money to them, Pranati saw the coins of various denominations. She got to know that money transactions can be done not only with rupees but coins also. When we returned home and counted the rupees and coins, she added it up to Rs 2800 and understood that how much more it will take to earn Rs 1 lakh.